There's a lot of stuff happening in this 10+ minute narrated walkthrough of Total War: Rome II's Battle of Teutoburg Forest event. By "stuff" I mean killing, stabbing, shooting, flanking, charging, lancing, burning and warhounding. Those Germanic forces aren't messing around, and here you get to see Creative Assembly attempt to survive the assault. It's pre-alpha footage - so not fully representative of how the final game will look. But even at its early stage, it's an impressive looking battle engine, with plenty of character and drama among the individual units. You also get a look at the game's new UI, including the heavily stylised unit cards and top-down tactical overview. 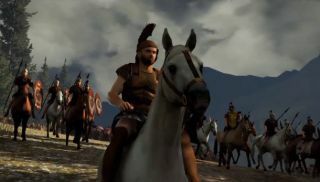 Total War: Rome II is due out in October.